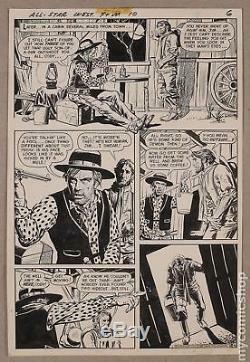 Original Art for All Star Western (1970) Issue 10, Page 6 by Tony DeZuniga. Original art for All Star Western (1970) #10, page 6 by Tony DeZuniga. Signed by the artist (reverse). Pencil and ink on Bristol board. 10 1/2" x 15 3/4". This item is a consignment. This item is a consignment, which means that the price has been set by the consignor rather than by MyComicShop. It is located at our headquarters and ships just as quickly as everything else we carry. The grade and description for this item were assigned by MyComicShop's professional graders, not by the consignor. You can expect the same high quality, reliable grading on consignments that we provide on all other items we offer. Learn more about consigning with us. The item image for this listing is not a stock image, it shows the exact item offered. We also accept consignments of comics and comic art. The item "Original Art for All Star Western (1970) Issue 10, Page 6 by Tony DeZuniga" is in sale since Saturday, July 29, 2017. This item is in the category "Collectibles\Comics\Original Comic Art\Interior Pages". The seller is "mycomicshop" and is located in Arlington, Texas. This item can be shipped worldwide.